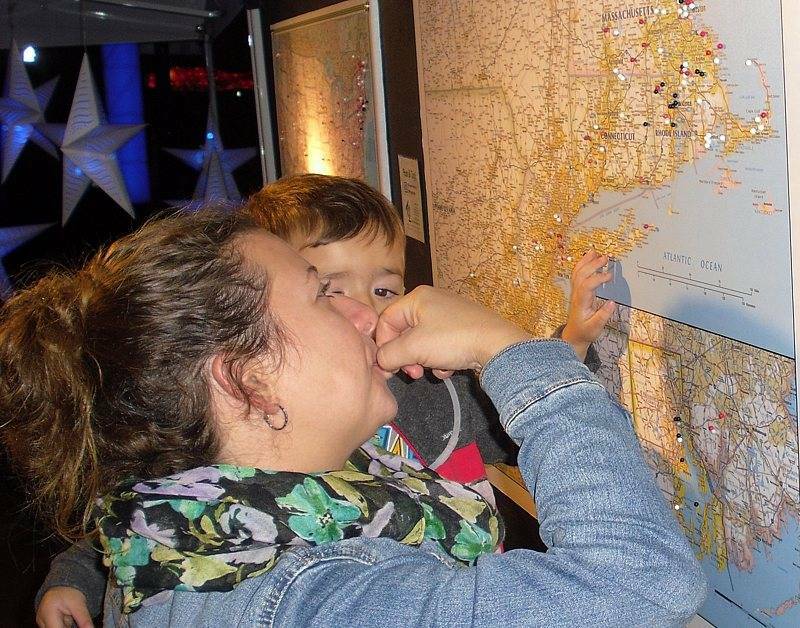 The interactive pinboard map exhibit was a hit all summer long at Providence's Waterfire events. When the booth was empty, it could stay empty for minutes, visitors determinedly streaming past or peering in from a polite distance. However, once a few people were in the booth, chatting, inserting their tack or just studying the maps, a line of others impatient to do the map thing would quickly form! This happened most of the time. 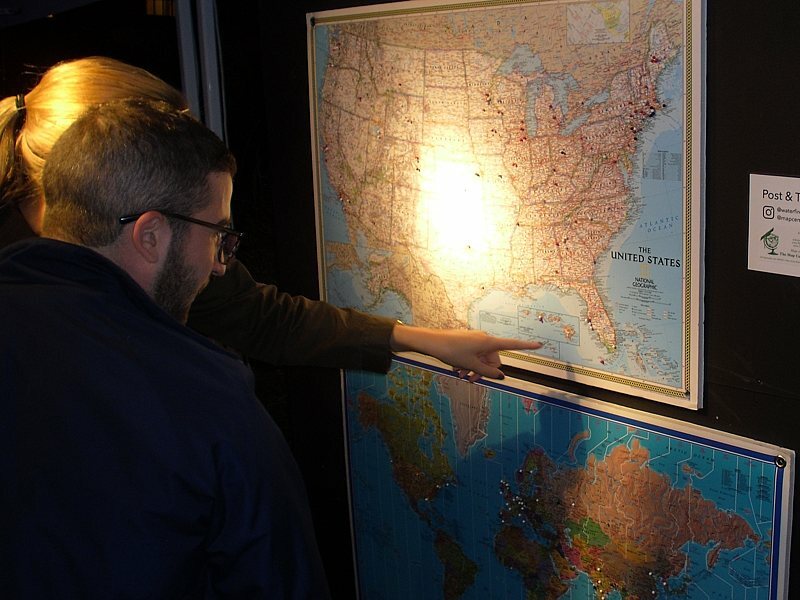 It takes hours for hundreds of people to consider the options, locate their exact spot and stick a tack into one of three maps. After some experimenting, we improved the maptack color scheme to be more revealing and simpler for participants to pick the right color. First we ask Are you on a trip or are you from around here? To locals, people not on an overnight trip away away from home, we give a white tack if it is their first Waterfire, a gray tack if they have been several times, and a black tack for the enthusiasts who had lost count. Travelers from away were asked: Was Waterfire the number one reason you decided to visit this area instead of someplace else? (red tack) Was Waterfire one among other considerations planning your trip? (Rose tack) Travelers in the area for unrelated reasons who serendipitously wound up at Waterfire are given a pink tack. You can look at the crowd and wonder who are these people? You can look at the map and learn quite a bit. This time, why might there be so many white tacks, supposedly local dwellers, scattered on the world map? Well, in September the students were back at the local colleges. They count as local dwellers but they are pleased as can be to commemorate their homes in distant states and countries! Many who have relocated to the Providence area for other reasons also marked their paths in life on our maps. In summer, there were many more red and rose tacks inserted in faraway places. 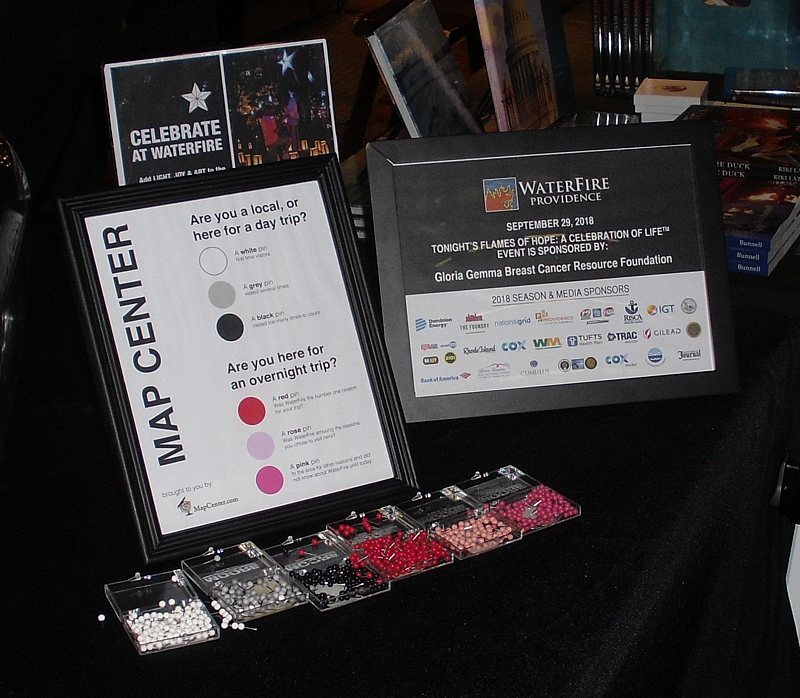 At five events, over 2700 people participated at The Map Center at WaterFire. Volunteers at the booth enjoyed speaking with tourists, students, transferees, immigrants, wanderers and neighbors about how their stories crossed with the evening's event. Every tack represents a unique story, which can become part of a larger story. For the statistical deep dive into what the maptacks tell us visit News from WaterFire Providence.